So yes, as I mentioned in my last entry at the end of February, I was traveling for a few weeks. That doesn’t entirely explain why I am only going to manage to get one entry done for March; after all, I wrote that single one for February when I was away from home. What does it explain it? Possibilities: lack of any sort of routine that gets me sitting at my laptop consistently, laziness, the knowledge that online journals are pretty much dead as a way to communicate, the distraction of a mountain right outside my front door, having a houseguest for a week and a bit immediately upon returning from my three-week sojourn in the Great Lakes, social media. Right now, though, I am here, determined to get an entry done about my trip before I get distracted by the other things on today’s agenda, such as going to the studio then later driving to the city to do some errands and meet up with friends down there. The morning after the festivities documented in my last entry, Mr. Karen drove me to the airport in Spokane. As fate would have it, it was snowing hard when we left the mountain, which meant he had to give up a powder day; that he did so without complaint is one of the ways I know he loves me. 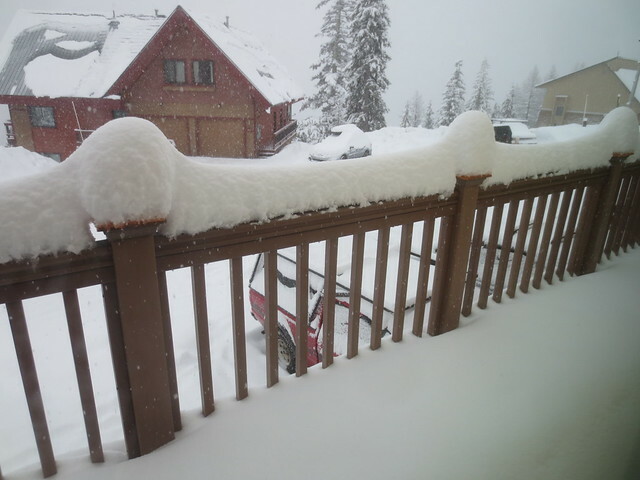 This was the view out of our front window that morning; something like six or seven inches fell overnight. 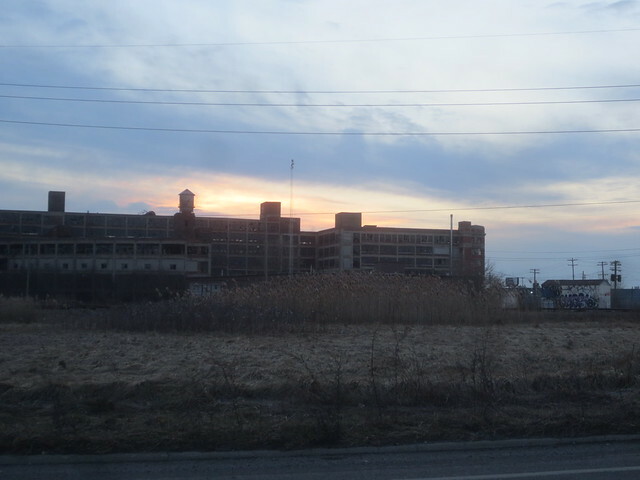 By the time I got to Detroit, two flights and a connection later, it was late at night, but it’s never too late to go to Meijer, so I did. I never did much middle of the night shopping when we lived in Michigan, but it was nice to know I could. Out here, even if I drive the hour-plus to the nearest thing we have to Meijer, it closes at 11 p.m. 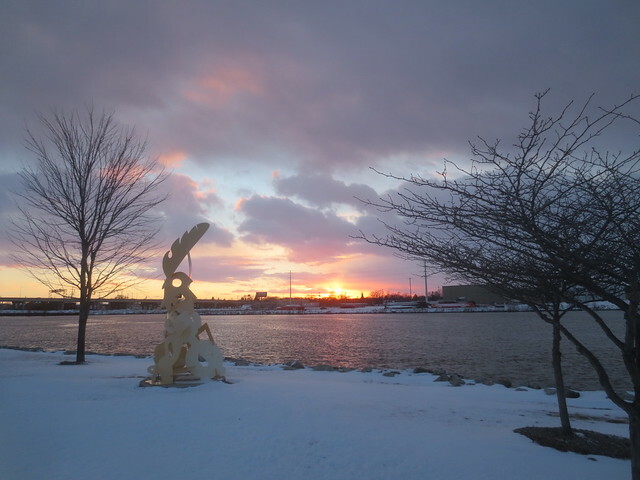 I spent the next few days revisiting old haunts and seeing as many friends as I could, snapping pictures along the way, like this Detroit sunset scene on my way to have drinks with a group of folks in Hamtramck. 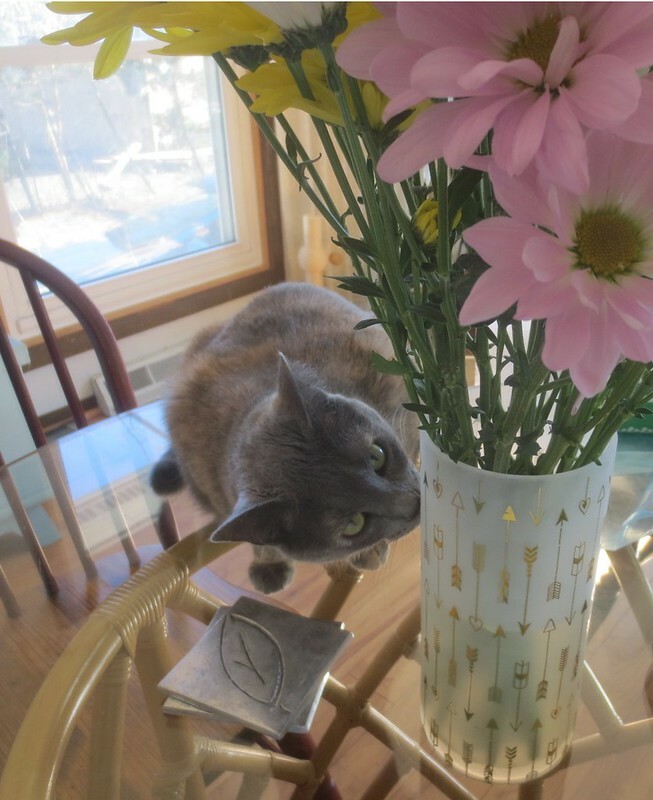 Next stop was Illinois, where I hung out with Mr. K’s mom, Joan, and tried to get some work done at my mom’s house, which was slow going due to lack of motivation and feelings of overwhelm. 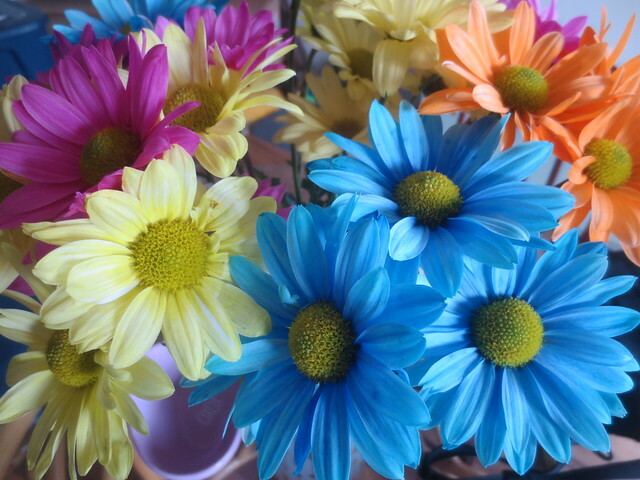 I talked some with my nephew’s girlfriend, she who was responsible for the bright flowers on the table where I sorted through the accumulated mail and planned other tasks. 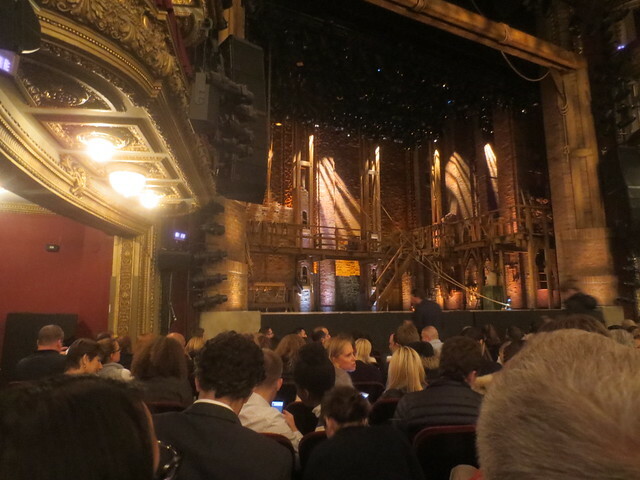 I wrapped up this portion of the trip with an evening in Chicago, seeing Hamilton with the ticket I’d bought last summer. I’d been shut out the first day tickets went on sale but managed to snag this single seat obstructed view (or maybe it was called limited view) for the night before Weetacon was scheduled to start. At that point, I was pretty sure I was going to Weetacon again, and even though I’d done no other planning for what that trip would look like, I figured I could get to Chicago that night somehow. The day before the show, Joan decided she’d join me, and the universe smiled upon us and I found a resale ticket not too far from my seat for not too crazy money and we made an outing of it. The show was everything I hoped for, and Wayne Brady as Burr was tremendous. If I’d had pots of money just sitting around, I would have gone to see it again later in my trip. Then I took a vacation from my vacation and headed up to Green Bay for Weetacon, which was as per usual a whirlwind of socializing and eating and naps. 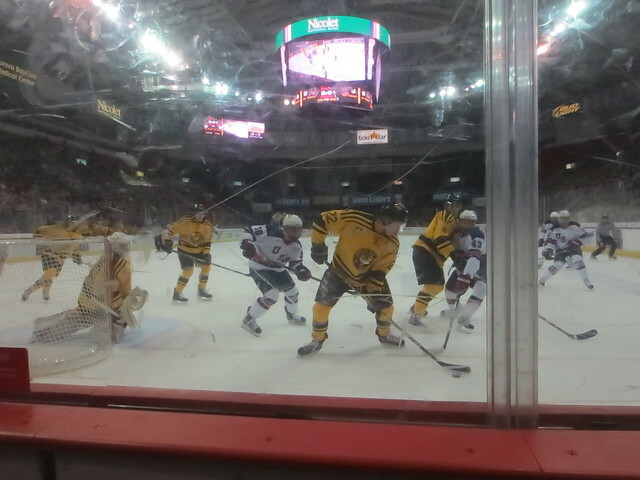 The new outing this year was a minor league hockey game, where we had seats on the the glass. Stuffed with cheese and happiness, I left Wisconsin to head back to Illinois for more hanging out with Joan and a little more poking at my mom’s house to figure out how much is still to be done before we can put it on the market. As I was leaving on my last day there, I couldn’t find the cat and worried I’d somehow missed her slipping by me as I went back and forth to the garage and my car. While I was debating what to do—assume I’d not let her out and leave or stay and keep looking—she strolled out from some hiding place and was all friendly, so of course I had to stay longer and pet and brush her. I finished up my trip with a whirlwind weekend in Michigan, including going to a quilt show and a nail ladies meetup before flying home. 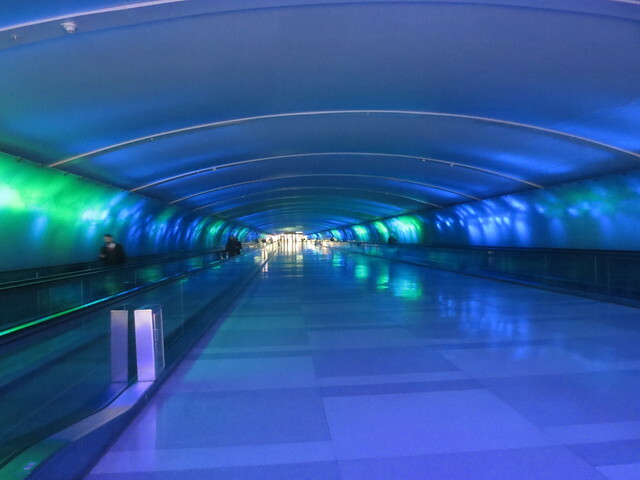 Even though my plane left from a gate that didn’t require me to go through the tunnel of fascination at Detroit Metro, I went down there anyway to enjoy the ambiance. No rush, as my flight out was delayed over an hour due to winter weather; fortunately I had a very long layover in Minneapolis so I had no trouble connecting to make my flight to Spokane. I did have some trouble communicating with Mr. Karen when it was time to pick me up; he’d collected our houseguest from the same airport a few hours earlier so was not just sitting around waiting for my call, so he didn’t follow up on my “I’m in baggage claim” text to him. I meant, “I’m in baggage claim with my luggage, please come get me” and he thought I meant “I’m in baggage claim and will call you when I get my luggage”. Eventually I figured out I needed to do the follow up, and the three of us drove off through the night to the mountain. All the photos I felt were fit for uploading from the day before my trip through the whole three weeks I was gone are over on Flickr in this set.